The Naked Dance of Jampa Lhakhang Drub is one of the most unique amongst scared mask dances held around the country. At midnight, 16 naked men perform the sacred dance, which has its origin in the 8th century. It is said that the dance was first held in Nabjikorphu in Trongsa by the great treasure discoverer, Tertoen Dorji Lingpa, on the prophecy of Guru Rinpoche. Like several dances, this has a story, too. Legend has it that a band of devils were obstructing the construction of a Lhakhang (Temple) in Nabjikorphu, delaying the work. As a ruse and to distract the devils, Terton Dorji Lingpa launched the naked dance. It served the purpose as the outrageous antics of the naked performers during the dance kept the devils spellbound. The construction was thus completed. The dance reached Jampa lhakhang as Terton Dorji Lingpa also consecrated Jampa lhakhang. This dance is performed by selected men from the four villages of Jampa lhakhang, Nobgang, Changwa and Nashphey. 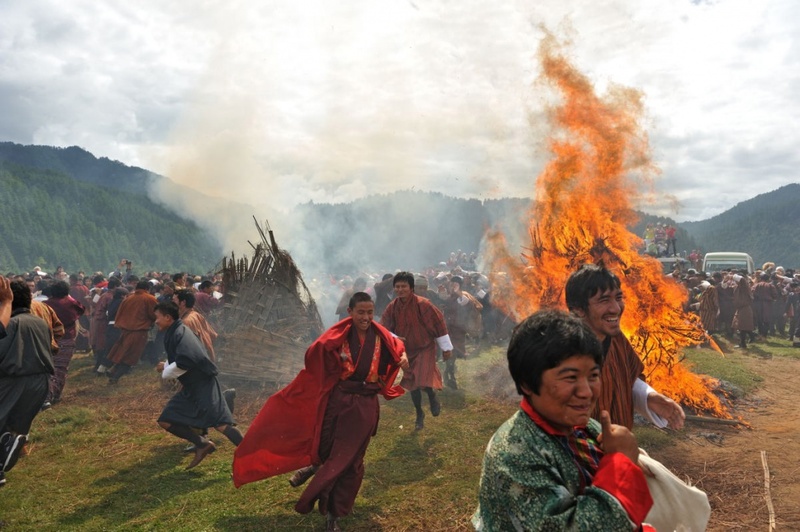 The main high light of this festival is ‘the scared naked dance known as Ter Cham and Mewang-the fire blessing’. A fire dance or Mewang is held in the evening to bless the infertile women so that they may bear the children. Arrive at Paro international Airport. During the journey to Paro, one will experience a breath taking view of Mount Everest, Kanchenjunga and other famous Himalayan peaks, including the sacred Jomolhari and Mount Jichu Drake in Bhutan and particularly exciting is the section through the Bhutanese foothills and the thrilling landing. On arrival at Paro International Airport, you will be received by representatives of our tour guide. After checking in and lunch you will visit places of historical importance in Paro, such as the National museum of Bhutan, and Paro Rimpong dzong. You will also be visiting Kyichu temple, which was built by King Songtsen Gyempo of Tibet in 659 AD. After an early breakfast drive up to the Ramthangka (base camp) of Taktsang and then hike up to the famous Tiger’s Lair. The three to four-hour drive from Paro traverses thorough a constantly changing kaleidoscope of vegetation, waterfalls, flowers, mountains and meadows. In about 45 minutes we will reach the famous Dochula pass (3,100m) where on a clear day we can see the entire eastern Himalayan range, teeming with 6,000m to 7,554m snow-capped mountains. The pass also known for its abundant species of extremely beautiful flowers has 108 Buddhist stupas exquisitely built around a mound, adding to the natural splendour of the place. After breakfast, we will drive to Phobjikha- a bowl-shaped valley on the western slopes of the Black Mountain. After lunch, we will visit Gantey Goenpa, seat of the Peling tradition. Later walk around the valley which is also the winter home to the rare black-necked cranes, which migrate, from remote parts of Tibet, China and Siberia during winter to this valley. Day 05: Phobjikha-Bumthang: After breakfast, we drive to Bumthang via Pelela pass, the traditional boundary between Western and Eastern Bhutan. En-route we will stop at Chummy village to visit the yathra weaving centre. Continue driving to Bumthang and stay at a local hotel. Day 06: Bumthang: Whole day sightseeing. Chakhar Lhakhang (Iron Castle). It is the site of the palace of the Indian King Sendha Gyab also known as Sindhu Raja. Kurjey Lhakhang (Kurjey means, “Body imprint”). The temple to the right was built by Minjur Tempa in 1652. It was built around the cave in which Guru Rinpoche meditated and left his body imprint. Tamshing Lhakhang. This temple is also known as Tamshing Lhendrup Chholing (Temple of the Good Message). And visit Jakar Dzong. The fortress is now used as an administrative center of the valley and summer residence of monks. Later in the evening, we will witness the festival. The first day of the festival begins last in the night. Apart from the Naked dance, another attraction unique to this festival is the Fire Dance (Mecham). The arch of pine is set on fire. The fire is said to purify the earth of evil spirits. People who pass through the arch have their sins cleansed. A dancer chases away the evil spirits. Day 07. Jambay Lhakhang Drub and MebarTsho (Burning Lake): After breakfast, attend the second day of Jambay Lhakhang Drup (festival). You will watch number of different dances, subdivided into three categories: those that are intended to give moral instruction; those that are designed to drive away evil spirits and those that celebrate the Buddhist faith in its many guises. This is the occasion where the local people, dressed in their finest clothes, come to attend the festival with packed lunches. After lunch drive to Tang valley to visit Mebar Tsho (Burning Lake. Day 08: Bumthang – Trongsa: After breakfast drive to Trongsa. And then Visit Trongsa Dzong – seat of the district administration, built in the 1648. And visit Tower of Trongsa -converted into the museum from watchtower that once guarded Trongsa Dzong from internal rebellion, stands in Bhutan’s history. Overnight at hotel. Day 09: Trongsa-Thimphu: After breakfast drive to Thimphu. Day 11: Departure from Paro: After breakfast, you will be driven to Paro international airport for your onward flight. Our representative will see you off.